I believe I promised to be back later this week with a summary of my plans for fall knitting. As it is now about as close to the end of the week as I can get and still be in the same week, I’d better hop to it! The three-word summary: autumn = lace. Of course, I’ll be working on some non-lace knitting as well – if nothing else, I want to finish my braided pullover. 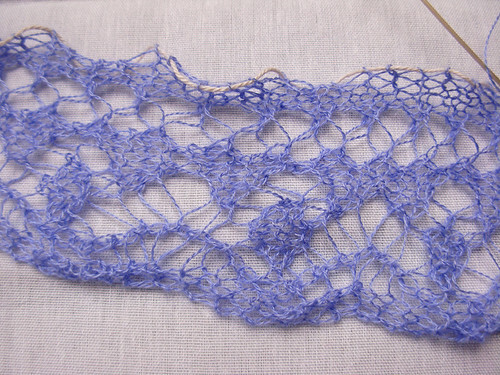 But with Seasons of Lace in full swing for the fall, I have eyes-bigger-than-my freetime plans for lace knitting. First up, Lerwick Lace Shawl (Ravelry link). I started this at the end of May thinking it would be the perfect summer knitting – lightweight enough not to stick to my hands during the hot summer weather and complex enough to hold my attention. As it turned out, we had very little hot summer weather (one of the coolest July’s on record) and my attention was distracted by the much less complicated braided pullover. So this has been languishing in the first half of the edging. I picked it up again last night, though, and added another four points, so maybe I can get on a roll and finish the edging before the fall’s out. Next, a very old UFO. I did some project organizing last spring, finishing up some, frogging and reassigning yarn on others, and delegating others to the “finish-it-soon” pile. (I’ve been on this big organizational kick lately. I’m almost surprised I haven’t purchased some containers to sort my smallish sized stash by yarn content and color family. Hmm….) Anyway, towards the bottom of the pile was a project that I started as part of a mystery stole project, two years ago. Turns out, I don’t follow along with mystery projects very well. It might have actually headed for the frog pond if I hadn’t seen a finished version of the shawl at the Great Lakes Fiber Show this spring. The pattern is Swan Lake by Melanie Gibbons, and I’m using Suri Elegance (Alpaca Yarn Co.) with some variegated blue-purple beads. Of course, what fun would fall lace knitting be without some new projects? 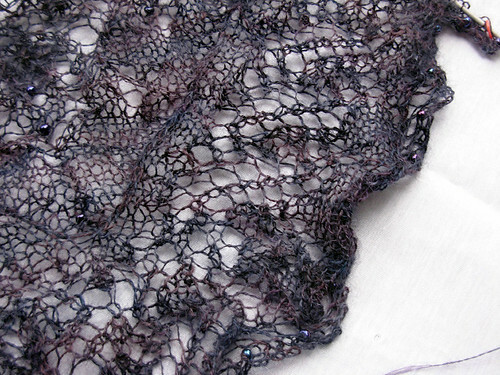 (Easily distracted by shinny new lace projects….) 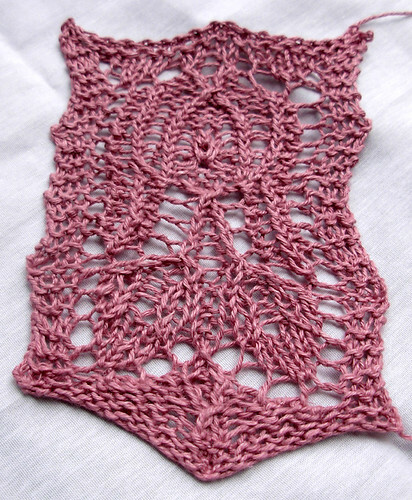 The first of the new projects is Rose by Susan Pandorf (Sunflower Designs). I’ve purchased several of her patterns, including all of the Garden Variety designs, but this is the first I’ve tried to knit. Although the pattern calls for copious amounts of beads, I think the lines of the design are strong enough that they aren’t necessary, so I’m opting to knit without any beads. I could, however, be setting myself up for a nice little UFO, as I decided this would be a nice summer stole of linen yarn (knitting it in the fall, I make tons of sense). I think the yarn works perfectly well with the pattern, but my hands aren’t quite as enthusiastic. They’ve been spoiled by nice soft merinos and cashmere-silk blends. So far, I’ve managed to complete two gauge swatches (blocked, even!) and the first four rows of the actual stole. The picture above represents the swatch at the needle size I’m using. Finally, THE fall project. Assuming I can find a gauge I like. 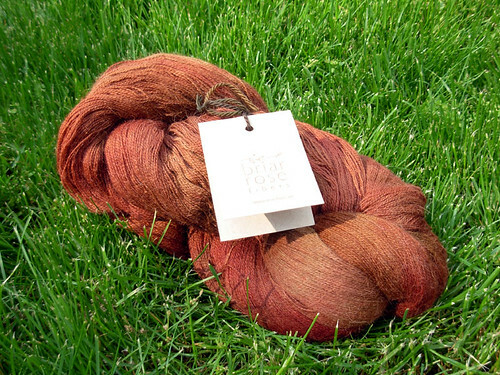 I bought this yarn in the spring, knowing it would make for a perfect autumn knit, with its reddish and coppery tones. The yarn is Briar Rose Angel Face, and is absolutely lovely. I also knew immediately that I wanted to knit Aeolian with it. There was a knit-along over the summer for Aeolian, but this yarn had to wait for the fall, so I’m just getting started swatching. Based on an initial swatch start, it may be a bit lighter weight than the yarn called for, but I was planning on making the largest size anyway, and as I’m on the short side (OK, downright short), I think it will work out ok. So, my plans for the fall. Over ambitious much? Guess I’d better get to knitting…. Those are some beautiful projects! And what’s a little over-ambition now and then? I hope that the linen works out; it looks like a really nice lace.